This week we are working with the some of the Glitz 'Wild & Free' collection that was in this month's 'Freedom' kit. 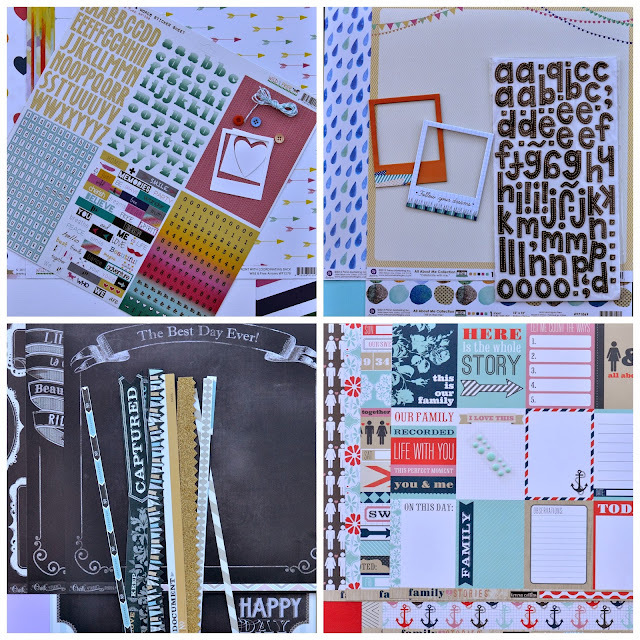 There are four papers from the collection together with an alphabet sticker sheet. Inthe kit this month was also a die-cut frame, a few buttons and some baker's twine so we're using those with the Wild & Free collection too. I loved these colourful hearts but felt they needed a border so I have cut the middle out of one of the other papers (to use elsewhere) and used it as a background. I've used the little frame to hold some embellishment, used the Thickers alphabet for my title as well as some of the small letters from the sticker sheet and used quite a few of the word stickers from the same sheet. This time I've used the drippy goo-style paper as the background - how cool is this paper! I've added in a few other layers, used more stickers from the sticker sheet to embellish and added a large title using Thickers but also used some of the small alpha stickers too.